It’s been an interesting few years for the GDSs. While the three big cheeses of the global travel distribution system landscape — Travelport, Sabre and Amadeus — continue to dominate the market, they haven’t had it all their own way. Google’s ever-creeping involvement in everything has spread to travel and the NDC has begun to draw support, most notably among the large European airlines like Lufthansa and British Airways. This is alongside a small, but growing, ecosystem of travel start-ups exploring alternative methods of distribution (yes, the blockchain). One of the major challenges faced by GDSs has been in providing TMCs with access to rich content. It isn’t that content such as cabin layouts, hotel photos, and car hire options aren’t available through the GDS, they are, it’s just that the complexity of using some GDS interfaces has made it hard for travel consultants to take advantage. However, things are changing and changing fast. There’s been a collective realisation throughout corporate travel that selling business trips as commodities is an outmoded practice. Instead — as the leisure sector has long known — you should be selling experiences, for which you need rich content so the customer can gauge what the flight or hotel will actually be like. As a result, the GDSs are investing a lot of time, money and development effort to better merchandise business travel — Sabre’s reboot of their ‘Red’ workspace is a great example of this. Expect this push towards richer content to only accelerate as the GDSs face a challenge in the NDC and the aforementioned start-ups. Part of the reason the content side of things is improving is down to sheer speed. Until fairly recently, many of the GDSs were still wedded to legacy systems that slowed down the merchandising process. Hardly compatible with our fast-paced, mobile-first world. Instead, travel companies need omnichannel tools that deliver instantaneous search results to help market and sell products. Again, this is an area the GDSs have begun to innovate. Amadeus is now able to process 20,000 queries a second as a result of ditching legacy infrastructure and basing their operations in the cloud — a similar speed to Google. Personalisation has long been the holy grail of corporate travel and it’s only likely to become more important with the encroachment of major tech players like Google, Facebook, and Amazon into travel. It’s also something the GDSs have begun to take very seriously indeed, particularly since the NDC was created with the express purpose of improving personalisation. There are a few positive developments on this front. Firstly, in some cases, airlines and GDSs are actually working together to improve personalisation, perhaps signalling a welcome thaw in relations across the industry. Secondly, there’s plenty of add-ons and new tech on the market to augment what the GDSs already have. Whether that’s third-party integrations to offer a wider range of options on hotels and transport or the growing number of small businesses helping to provide aggregation tech that works alongside the GDSs. Like everything else in society, corporate travel is becoming ever-more automated. However, we’re a long way from the point where travel consultants can hang their boots up in favour of travel automatons. So for the time being, the focus in automation is on making travel consultants' lives easier and allowing travellers to do more themselves without the help of their TMCs, such as changing seats, upgrading or even switching flights. On the former, the GDSs are making progress as they switch to a more mobile-centric model that gives the traveller greater autonomy — although this obviously poses some problems for TMCs who generally charge for this service. In the case of the latter, as well as improving GDS interfaces, there are a growing number of add-ons available to help free up traveller managers for the more ‘human’ aspects of their job — such as trip briefing and tailoring the experience to each individual traveller. These range from GDS data decoders that help cut-out hours spent manually interpreting flight data, to automated ticket inspectors to automatic visa checking. According to 2016 research from Collinson Group, almost three quarters (72%) of business travellers bolt-on additional leisure days to their trips, so it’s time to stop talking about ‘bleisure’ as the next big thing and accept that it’s here to stay. This seems to have been tacitly acknowledged by the GDSs, although they may have been caught a little off guard to begin with. Firstly, the process of improving GDS content we discussed earlier is an important part of accepting bleisure’s popularity — when planning leisure activities or picking a hotel to relax in high-quality content is key. Secondly, there is a growing, if begrudging, acceptance that sharing economy players like Airbnb are here to stay and phenomenally popular with younger travellers, leading to GDSs exploring ways to integrate that content. Finally, there’s the role played by GDS approved bolt-ons connecting customers to a greater breadth of choice like EAN integrators. Despite the near-annual doomsaying about the demise of the GDS, the future looks surprisingly rosy. There is a growing embrace of change, demonstrated by the détente between the GDSs and some of the big airlines, as well as the willingness to work alongside smaller innovators to make the overall customer experience better. This is alongside the GDSs own efforts to improve the content on offer to TMCs and travellers — removing one of the big sticking points of the past. Lastly, there are a growing number of add-ons to help you improve upon what your GDS currently offers. 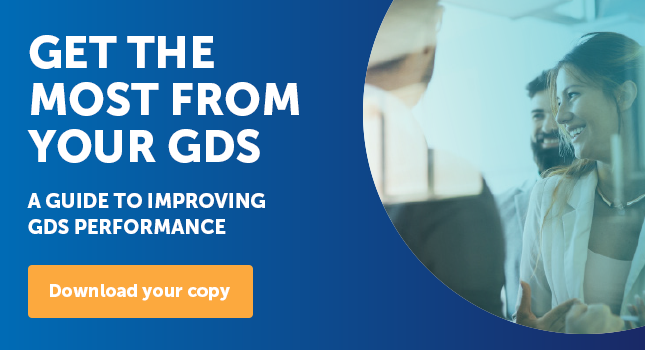 To learn more about getting the most out of your GDS, download our ebook.